Love blossoms in the air at the Pendle Hippodrome for the company’s latest production. “The Pajama Game”, a musical based on the novel “7½ Cents” by Richard Bissell, deals with labour troubles in a pajama factory. In the midst of this, love blossoms between Babe played by Penelope Hatfield, and Sid played by Josh Hindle. The show runs from until Saturday with 7-30pm nightly performances and a 2pm Saturday matinee. 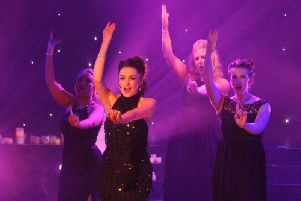 Tickets are available now online at www.phtheatre.co.uk or from the Pendle Hippodrome Theatre box office. Tickets are priced at £12 for adults, under 19s £8 and concessions £10.